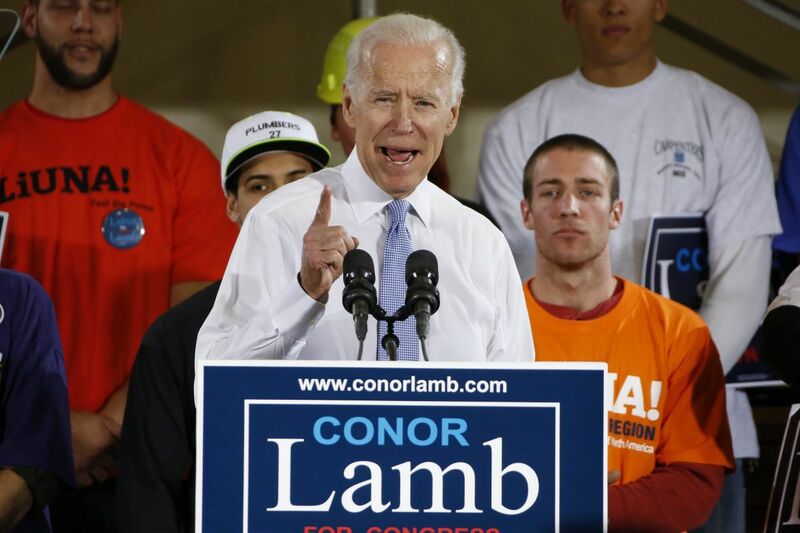 Former Vice President Joe Biden speaks at a March 6 rally in support of Conor Lamb at the Carpenters Training Center in Collier, Pa., on March 6, 2018. WASHINGTON — Taking the stage in Trump country in southwestern Pennsylvania, the former vice president began simply: "My name is Joe Biden, and I'm from Scranton, Pennsylvania." With that nod to blue-collar roots earlier this month, Biden launched into a paean to working-class values in the kind of place that has long been lost to Democrats — and that he hopes to win back. Campaigning alongside fellow Democrat Conor Lamb, Biden offered not just policy proposals, but firsthand experience. He described how his father struggled to pay for his college, worried about health insurance, and raised a family in a crowded split-level home — and argued that Democrats are offering the policies to help those same kind of people today. Crossing the country and much of Pennsylvania, Biden has become Democrats' informal liaison to the white working class, which makes up much of Trump's loyal base. In the process, he has stirred speculation that he is angling for a showdown with Trump in 2020. The president has apparently taken notice. On Thursday morning, he blasted Biden on Twitter. "Crazy Joe Biden is trying to act like a tough guy. Actually, he is weak, both mentally and physically, and yet he threatens me," Trump tweeted. "He would go down fast and hard, crying all the way. Don't threaten people Joe!" The attack came in response to Biden's saying that if he were in high school, he would "beat the hell" out of Trump over the president's lewd comments about groping women on the infamous Access Hollywood tape. Biden made the comment at the University of Miami, during a busy public schedule that has kept him in the spotlight. Two days after Lamb's victory last week, Biden endorsed two more Democratic challengers in tough congressional races just outside Philadelphia. He spoke at Duquesne University in Pittsburgh, honoring the late Steelers owner Dan Rooney and hailing their "shared Irish values." He has written a book, is advocating to find a cure for cancer, and recently launched the Penn Biden Center for Diplomacy and Global Engagement at the University of Pennsylvania. And on Wednesday Biden met in Washington with congressional Democrats' Blue Collar Caucus, co-founded by Rep. Brendan Boyle of Philadelphia. In that meeting, Boyle recalled, Biden told nearly 40 Democrats that after so many working-class voters supported Trump, "they want to come home again." The former vice president signaled that he's going to try to help bring them back in 2018 as the parties battle for control of the House. "He's fired up and ready to go in terms of campaigning for Democrats across the country in this election," Boyle said. "His energy and enthusiasm and passion are just as high as anyone who's in their 20s or 30s." Amid the aggressive liberalism of Bernie Sanders and Elizabeth Warren, and the cosmopolitan appeal of Cory Booker and Kamala Harris, many Democrats see Biden as the kind of messenger they need in old steel towns and coal country. Lamb brought Biden in for the closing days of his congressional race in a district Trump won by nearly 20 percentage points. They visited a carpenters training hall and then rallied in front of several hundred Democrats. As Biden gave his 30-minute speech, you didn't have to look very hard to see the makings of a presidential campaign theme or, at the very least, a road map for fellow Democrats. Describing how his father, a used-car salesman, worried about what would happen to the family if he got sick, Biden said insurance is about more than health, "it's about peace of mind." He told how his father was unable to get a loan to help send him to college. "I'm so ashamed," Biden recalled his father saying, bringing the crowd to a hush. His voice soft, he said, "Middle class where I come from is not just a number, it's a value set." And he hammered House Speaker Paul Ryan, arguing that Republicans were giving "obscene" tax cuts to the wealthy rather than paying for college programs or job training. Joseph DiSarro, chair of the political science department at Washington and Jefferson College, about 30 miles southwest of Pittsburgh, believes that the former vice president is laying the groundwork for a presidential campaign, and that he could provide the kind of message Democrats have lacked. "He is viewed as the average Joe, the average person," said DiSarro, a member of the Pennsylvania Republican State Committee. "He has that appeal, and he went over quite well here." To Joan C. Williams, who has written extensively about working-class voters and Trump's appeal to them, a focus on economic struggles — not exclusively cultural ones — is critical. "As a Democrat, to me, it's really painful when millions of Americans see Donald Trump as the person who is articulating their sense that they're losing hold of the American dream," said Williams, a professor at the University of California Hastings College of Law. "To me, that's a progressive issue. Broadly shared economic growth is one of the absolute tenets of what Democrats should stand for as a party." She, like Boyle, said much of Democrats' problem comes down to their tone. "The white working class has no problem with people with money. What they have a problem with is being condescended to," said Williams, who has written a book called White Working Class. Biden, in a statement to the Inquirer and Daily News Wednesday, began with that very point. "We need to once again let working people around this country know that we hear them. That we understand their problems. High school educated, working-class folks have real concerns – they're not imagining what they're living through," the former vice president said. "They want to be respected for the work they do." Democrats have made big gains with college graduates, according to the Pew Research Center, but among white voters who did not go beyond high school 58 percent supported Republicans in 2017, and just 35 percent backed Democrats. Boyle, raised in a blue-collar family in Olney, argued that many of these voters can be won back. He said that 11 percent of Pennsylvania voters who backed Barack Obama twice switched to Trump. "So it's not as if we we're attempting to chase voters who left the party 30, 40 years ago." And he, like Williams, stressed that Democrats shouldnNo't see the outreach to blue-collar workers as a choice between social issues and economic ones. He said both should be part of their platform. Recent polls suggest that Biden would begin a presidential race as a favorite against fellow Democrats and Trump — though in many ways it's easier to be popular as a hypothetical candidate who is out of office. Biden enjoyed little success in his previous two runs for president, and would be 78 by the next inauguration day. An opponent might try to puncture his blue-collar persona by noting that he has spent most of his life in the Senate and White House. Still, Boyle argued that Biden retains an authentic air that underpins his appeal. Said DiSarro, the professor and Republican from southwestern Pennsylvania, "I think many people, including some of my Republican friends, would say: I don't want to see him … I don't want to see him campaigning for my opponent."